1st LSE CSS Hackathon! London 17-19 April · Gokhan Ciflikli, Ph.D.
Whew! Less than a month left and I still haven’t publicised this on my blog. People, we are hosting the 1st Computational Social Science Hackathon at the London School of Economics and you are invited! It’s completely free and open to all. With that said, we will prioritise students/recent graduates and participants from the under-represented segments of the society. Unfortunately, we do not have the funds for providing travel grants. We will take care of all catering throughout the event. Once your place is confirmed, you will be able to tell us any dietary requirements you might have. Attendance is capped, but set tentatively for now. On that note, we will also ask for your t-shirt size. Tote-bags come in single-size ;) Freebies for everyone! GitHub offered to provide a prize pack for the winning team and we didn’t say no! No sleepovers! The event starts at 10am and finishes as 9pm on both days. Go out with your team-mates, do something social (hello, London), have herbal tea and go to bed early—your call, we don’t judge. We aim to have four distinct computational social science challenges. Currently, we have three challenge-issuers confirmed: LSE Social and Economic Data Science (SEDS), GitHub, and Facebook Research. We are still reaching out for the fourth, so if you happen to know a suitable institution/company/NGO/start-up, send them our way! We will publicise the challenges a week before the event. The first day of our event (that is, 17 April), is actually a pre-event. That is, no hacking will take place. Instead, that evening (6-8pm) is for getting your badges, watching videos of the challenges (sponsors themselves won’t be there for the pre-event), and team-forming. You should definitely not skip this day, even though the poster makes it look like you can!1 Do mingle with the others—drinks are on us. We have a wide range of workshops that will run in parallel to the main event. That is, you can take a time-out from hacking and enjoy one of our beginner-friendly workshops. 11am: Amy Dickens and Wilhelm Klopp, two GitHub Campus Experts, will introduce version control with GitHub. 2.30pm: Grace Meyer, data science lead at Oxera Consulting and a mentor in R-Ladies London, will dive into data manipulation with dplyr. 4pm: Kohei Watanabe, post-doctoral researcher at the LSE Methodology department and a main contributor to the quanteda package, will set you up for quantitative text analysis using R.
11am: Marc Cohen, developer advocate at Google Cloud Platform, will showcase the capabilities of the new AutoML Vision API. forming up the panel. We are still in talks with adding more practitioners, so stay tuned! Again, if you think someone would be a good fit, give us a shout. We will conclude with a drinks reception (7.30-9pm), so you will be able to mingle with the panellists and network with our sponsors. Cambridge Spark, agreeing to finance the dinner on Day I. They said pizza first! We will offer healthy alternatives as well. 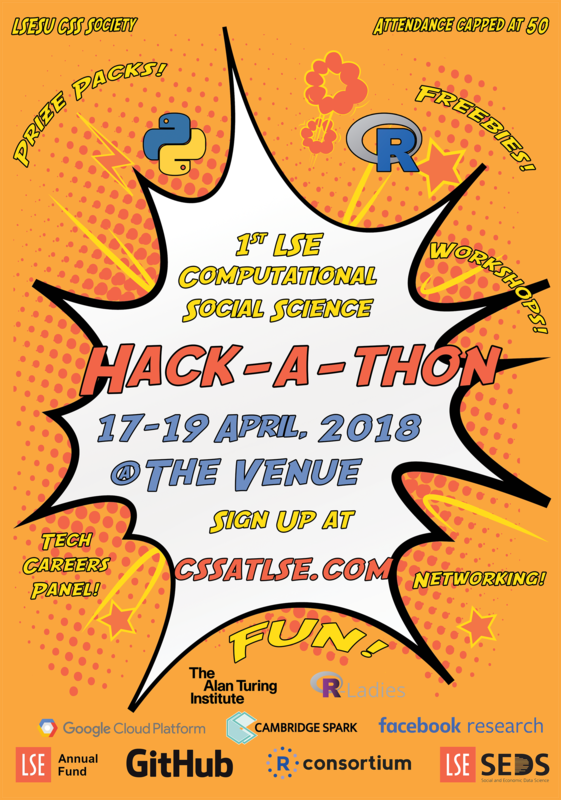 You can register at the official event website at cssatlse.com, which is also built using the blogdown package in R (cheers, Yihui). There you will find an FAQ section under the event tab, which I will aim to update regularly in the upcoming weeks. Once the hackathon is over, you will be able to use the permanent website as an online portfolio of your work/contribution. We will also post event pics and videos soon after. This whole thing is for you, you know. That’s all for now, do come if you are around and spread the word on social media: engage with our public Facebook event or share this post using the buttons located below. See you in London!